Rosie Dutton continues to tell us about her volunteer trip in Romania. 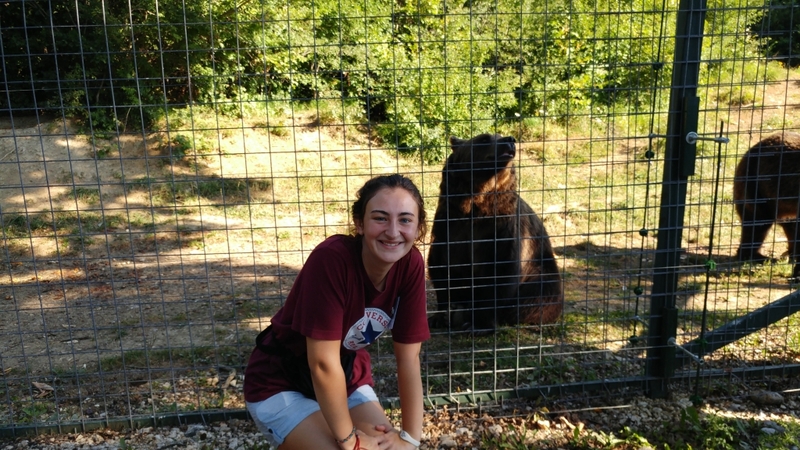 She is volunteering at the bear sanctuary close to Brasov, and having an amazing time! Today started out a little cooler so I packed my rain coat for working at the sanctuary as well as my sun cream, you can never be too careful! Because we had sorted through so many dairy products the previous few days for food for the bears, todays instructions were to prepare meat only. I had done a couple of meat baskets here and there previously; however, this was a whole new kettle of fish (pardon the pun). At first the meat does smell, I have to be truthfully honest and say some products do make your eyes water a little, however that soon disappears and everything is fine due to most of the food being kept in the freezers. Myself, Ivy and Miriam split the meat evenly and began taking off the packaging and putting the meat in the crates which are then shovelled out and thrown over the fence for feeding. There were chickens to sausages to eggs amongst a lot of other meats. Singing along with some music from the van that brings the food to us we soon realised it was time for lunch. The time really does fly by. We returned after lunch but not before I photographed the two teenage bears running around and play fighting, which I could honestly watch for hours! We finished up the last of the meat and had actually gotten a lot of crates finished between the three of us. Before leaving I gave all the dogs some attention which they really love and scratched behind their ears and on their bellies. We then returned back to the flat where I sat in the garden and took in evening sun and planned the weekend ahead. I can’t believe it has been an entire week in Romania since arriving! The time has flown by and I only have 3 more weeks to go! Despite this, for me, today was the best day so far! Today we got to go around with the workers and feed the bears. Well, we watched but I’d rather that than attempt to throw the heavy meat and dairy stacks over a tall fence with a spade! 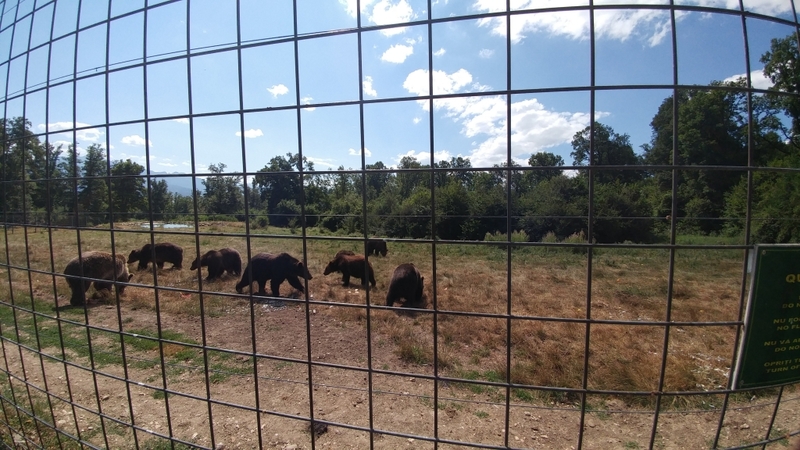 It was amazing to see so many bears all together at once and eating, mostly peacefully, next to one another. What I found even more fascinating is that Dika (one of the workers) who has worked at the sanctuary from day one, knew almost every single bears name. That’s amazing knowing there are well over sixty individuals! He knew their stories and all about their favourite feeding spots and so on. It was so interesting. We came across the alfa male, Urs which literally translates as ‘bear’ from Romanian, and he was absolutely huge and such a beautiful looking bear. He was very healthy and has a beautiful coat of dark fur with a light head. It was also great to see Lydia and Christie, two of the first bears at the sanctuary, it’s so great seeing how they are now and how much more relaxed and cared for they are than the life (if you can call it that) they previously had. We also went to Max’s enclosure to feed him. Max is a well-loved bear by a lot of the staff. Max is in an enclosure with a female and that is it. He is kept away from the public due to him being blind. The blindness occurred when his previous owner stabbed his eyes with pins intentionally to make him easier to control. Today Max seems happy and comfortable. He knows his enclosure extremely well from each tree to the pond to where the food truck stops. It was fascinating to watch and he is a beautiful very dark brown almost black coloured bear. The feeding took us from 8:30-12:00 due to the amount of food. We then helped the guys with the fruit for the bears and goats and donkeys that also call the sanctuary their home. We actually finished an hour early so we fed the donkeys and waited by the entrance for a ride home, it wasn’t bad waiting in the sunshine with the mountains and rolling hills as a view! Once we got back, myself and another volunteer walked into town and did the free walking tour which took 3 hours and showed us all the historic features of Brasov which were very interesting. We stopped off at the main square, the black church, the 3rd narrowest street in Europe, listened to some Dracula and Vlad history and more. This was a great way to end the day and I cannot wait for the weekends activities! Wow, what a day! With working all day everyday Monday to Friday at the bear sanctuary I was planning that Saturdays would be the time for a sleep in… Not this Saturday I woke early to go PARAGLIDING! This was something myself and some of the other girls booked as we knew the landscape and the mountains were so beautiful, so to see them from above would be even more incredible! We arrived at the location with two very cool instructors and talked endlessly all day, the ride up the chair lift was beautiful and this was where the instructor told me about how to take off and land. I felt fairly confident however after seeing some of the other people we didn’t know have some difficulty with their take off due to sitting down too early I became a little sceptical. Despite this it was our turn, myself and the instructor were strapped together, I had my GoPro at the ready and we ran down the hill, we kept going until we were lifted into the air and began the stunning journey down to the ground. We were talking while in the air and the take-off went very well I was pleased to hear, then we just enjoyed the sound of the wind and peoples delighted ‘woohoos’ and so on. This had to have been one of the best experiences of my life! We returned to the flat afterwards and I immediately started to watch the GoPro videos! Today was yet another early start and me and two other girls visited Peles Castle which is a real Disney looking castle surrounded by forests, mountains and streams with some waterfalls. This truly was the setting of a fairy-tale story! We bought tickets (which were only 5 lei for students) and walked around the grounds and then went to go see inside the castle which was beyond beautiful! Everything was handcrafted and gold and so on! There was a lot to see and we had a great time. We came back to Brasov where we had some lunch and went for a walk around the town. 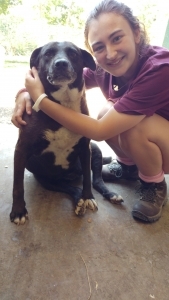 To find out more about Rosie’s volunteer trip, check out our bear sanctuary volunteering page.